Micromax is known for rebranding many phones and bringing them to Indian smartphone users. I haven’t owned many of the Micromax phones yet, but I had the Micromax Canvas Nitro which was the rebranded Coolpad F1. But today, after a lot of teasers and spoilers, they launched a new phone- Micromax Dual 5, which carries dual camera setup as the main USP. 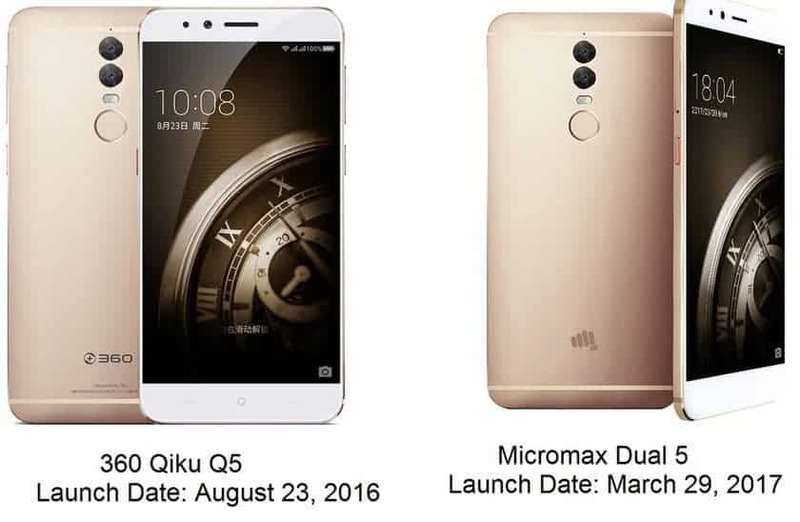 But, looks like the hype and all the buzz is quite lame as the Micromax Dual 5 is also another rebranded bottlenecked phone when compared to the 360 Qiku Q5, which was launched back in August 2016. Still, you don’t believe me? Here’s a picture of both, side by side. As you can see, both the phones are exactly similar regarding looks and design, just that the logo is different. Well, even the wallpaper is same. Now, this isn’t a coincidence or some conspiracy by the Chinese or Illuminati, well played Micromax. Looks and design are not everything. Inside the phones, there are same Qualcomm Snapdragon 652 Octa-core processor, coupled with 4GB of RAM and Adreno 510 GPU. Both the 360 Qiku Q5 and Micromax Dual 5 have the same camera configuration- 13MP+13MP rear cameras and 13MP front facing camera are available on both the 360 QIku Q5 and the Micromax Dual 5. Even the battery capacity is same as both come with 3200mAh battery with Quick Charge 3.0. Both the phones have 128GB of storage onboard. Both the phones have 5.5-inch full HD display and promise chip-level encryption, private mode and just everything else is also same. The only difference is the pricing, while the 360 Qiku Q5 comes at 1999 Yuan or around Rs. 19,000 (approx. ), the Micromax Dual 5 is priced at Rs. 24,999. So I think it’s a hard to think about the level of innovation they are doing. I won’t blame Micromax if they rebrand good phones, but at least please stop bragging about innovation, great design and how you worked hard to bring this phone to consumers. Replacing a logo isn’t innovation, but innovation at its tiniest part is when you rebrand a phone at a high price which people will buy for sure and hence, the developer community grows. I have experienced that after using the Canvas Nitro as my daily driver for almost a year or so. At a budget between Rs. 20,000-Rs. 30,000 wouldn’t people go for better phones like OnePlus 3T, Honor 8, Moto Z Play? For the Micromax fans, who were planning to grab this new phone, have a look at this comparison table and rethink. I won’t talk about performance much as I don’t have the phone with me to compare, but as the online and exclusive phones are taking the Indian market at an excellent pace, I think Micromax should rethink about the innovation, pricing, and rebranding. Previous articleThe Rise of Chinese Smartphone Manufacturers – Why Indian Mobile brands failed miserably?